Maybe you’ve made it big in your industry and have over 100,000 fans that hang on to your every word as if you were speaking directly to them. Or maybe you are still climbing your way to success but have a loyal following that strongly believe in you and your message. No matter how big or small your brand is, you may be asking yourself how to convert all of those likes, followers, and fans into your marketing funnel? Well, look no further because here at Prime Concepts Group we have the answer and they are called lead magnets! So what are Lead Magnets? 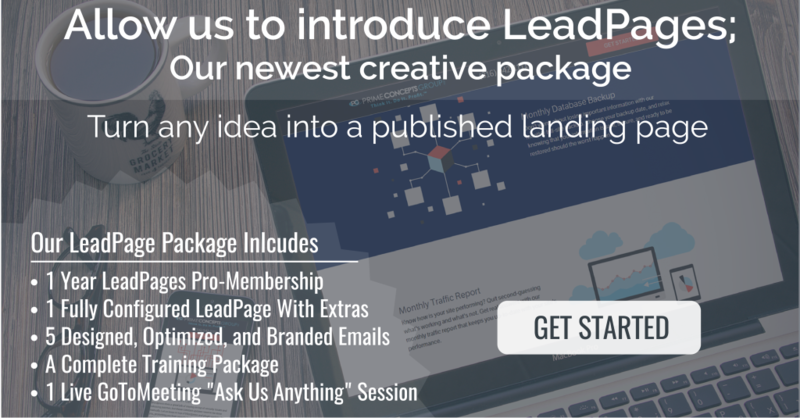 You are probably already generating content that would be perfect to convert into a lead magnet! How can you use lead magnets effectively? You may already have the content, and now you need to figure out a way to capture customer information to send important updates to at a later date. For example, you may have visited a popular blog and were prompted to give out your email for weekly blog post updates. BOOM! Just like that you have entered your information into their lead magnet database and will now be provided with updates about their brand (brand loyalty!) that could ultimately help you make a buying decision. There are a lot of factors that go into generating an effective lead magnet campaign. There are coding processes, content and design decisions, data metrics monitoring and reporting, follow up, and much more! While all of that may seem like a lot of time an effort that you simply don’t have, we want to assure you that you are not alone. Prime Concepts Group will partner with you to help create and monitor lead magnet campaigns that will help target your key customer base and ultimately increase sales. If this sounds like something you might be interested in incorporating into your marketing plan, give us a call at (316)942-1111 and we can develop a plan together.